We deliver roll off dumpsters to job sites in the Katy, TX area. Call us today for an immediate price quote and prompt delivery. Our team of waste professionals can help you determine the correct size for your project, and our flat rate pricing leaves all the confusion out of the dumpster ordering process. We’re ready to serve up a dumpster as soon as you can order it. We’re usually a day ahead on scheduling, just give us the drop instructions and we’ll send a dumpster to your job site. Discount Dumpster is excited about making our customers happy with their dumpster rental needs, and we look forward to talking to you soon! Useful for medium jobs, both interior and exterior. The 20 yard dumpster can handle a few rooms, roofing jobs, garage clean outs, attic clean outs, and some landscaping projects. The 30 yard dumpster is a good size for large construction projects. This dumpster can usually handle a 2,000 square foot house remodel. When the 30 won’t cut it, order the 40! This large dumpster has high sidewalls so bulky debris isn’t an issue. I've had great experiences with Discount Dumpster. Highly recommend them. Discount Dumpster is always renting more dumpsters to folks in the Katy TX area. Call us today and we can walk you through the simple ordering process. 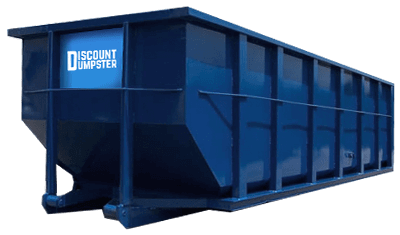 Discount Dumpster can help you to make the right decision on size and make sure that what you’re disposing of will fit in a dumpster on both size and weight. Discount Dumpster delivers dumpsters all over town, and we really enjoy working with people in Katy, TX. Our customers always receive the dumpster they order, when they order it, and we’ll work hard to make sure all goes well with the delivery and pick up. We’re passionate about dumpster service, call us today!